Android TV is getting some serious attention this week with updates to just about all of the Google apps, including a few that most of us never hear about. An update to YouTube’s set-top variant just came out with a few subtle changes. The latest release fills out the interface a bit to make channel subscriptions slightly easier. There are also some new shortcuts and reorganization for Settings, including a toggle to enable Stats for Nerds mode. And YouTube Red subscribers will finally see a visual change when their subscription status is recognized.What’s Newscreen-a01screenshot-b01Home screen – Left: old version. Right: new version. The home page has gone through a couple of subtle but notable changes. To begin with, YouTube Red subscribers will now see the word “Red” in the logo area to indicate that they will be going commercial free. Icons have also been added to each of the sidebar destinations.More importantly, the Settings link has been moved up to the main list of navigation items. It used to be buried at the very bottom of the sidebar, even below channel subscriptions. If you had a lot of subscriptions, it became pretty tedious to scroll through the full list to reach the end.nexus2cee_screen-a02 nexus2cee_screenshot-b02Settings screen – Left: old version. Right: new version.Once you reach the Settings screen, it looks like quite a bit has been added, but it’s not all that much different. 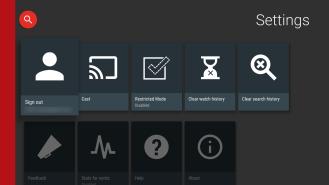 There are a couple of new options for Cast and Help that simply open up Google Knowledgebase articles related to Android TV.